Will Voice of Russia return to shortwave October 2014? I thought, perhaps, these were schedules posted prior to VOR leaving the air, but Stephen notes that VOR has posted and made constant changes to their B14 schedules as well. Stephen follows schedules closely as he has a website and app devoted to shortwave radio schedules. This does seem like a lot of effort if VOR has no intention of returning to the shortwaves. Stephen also points to this article which mentions that Russia may be bringing back shortwave and a new body might be in charge of operations. I suspect if VOR is returning to shortwave, it is in reaction to the recent changes at the Voice of America/Radio Liberty and the promise that HR4490 might increase a pro-US presence on the air. In the end, we might not know until VOR actually resumes shortwave broadcasts. This entry was posted in Broadcasters, News, Schedules and Frequencies, Shortwave Radio and tagged HR4490, VOA, Voice of Russia, VOR, VOR Cuts on August 20, 2014 by Thomas. Facing legal problems, the Russian government-funded radio network — the Voice of Russia — has fired its Washington bureau staff and closed the office. The shutdown happened Monday, amid allegations of tax fraud and claims of racial discrimination at the network. Alexei Iazlovsky, the head of the VOR’s U.S. operations, pleaded guilty last year to tax fraud and will be sentenced later this year. VOR’s employment practices also have attracted attention from the IRS and the Equal Employment Opportunity Commission. The IRS is investigating whether VOR used contractors alongside full-time, salaried employees to skirt payroll taxes. The Equal Employment Opportunity Commission took an interest in VOR after several former staffers claimed they were fired because of their race. The employees have filed a lawsuit against International TV Services, VOR’s contract manager in the United States. Some suspect Voice of Russia will quickly return to the U.S. through a different management company without the legal troubles. 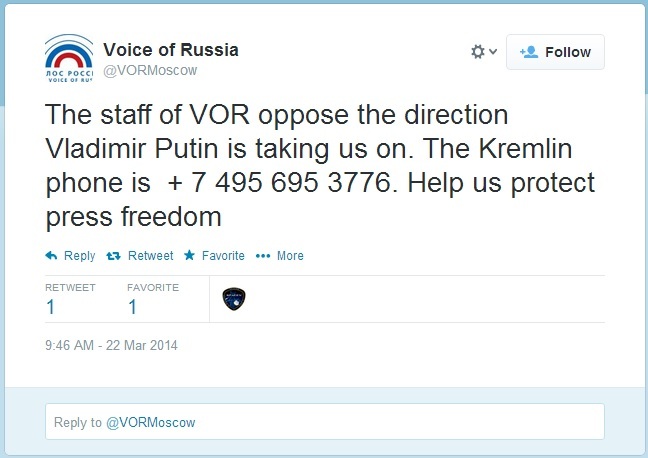 Earlier this year, the Russians stopped Voice of America broadcasting in Moscow on AM radio. This entry was posted in AM, News and tagged AM, Voice of Russia, Voice of Russia DC, VOR on July 16, 2014 by Thomas. 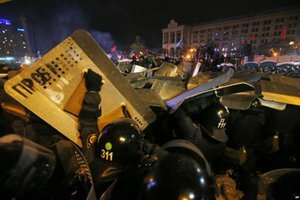 Updated: “Putin wants to silence Voice of Russia”–? Two days ago we learn that the Voice of Russia plans to end all shortwave and medium wave broadcasts as of April 1, 2014. This entry was posted in Broadcasters, International Broadcasting, News, Shortwave Radio, What's On Shortwave and tagged Vladimir Putin, Voice of Russia, Voice of Russia Cuts, Voice of Russia Ends Shortwave, Voice of Russia Leaves Shortwave, Voice of Russia Shortwave, VOR, VOR World Service on March 22, 2014 by Thomas. It appears that after all of the rumors from last year, and after the cuts to shortwave broadcasts earlier this year, the Voice of Russia has decided to stop broadcasting on shortwave entirely. This is to thank you for your message and confirm the information about the upcoming cancellation of the Voice of Russia’s short- and medium wave transmissions as of April 1, 2014. I remember when the Voice of Russia and Radio Moscow absolutely dominated the shortwaves, especially in my early years as a radio listener. Times have changed for this broadcaster who has been the mouthpiece for Russia and the Soviet Union. On a side note, if you have the ability to record the Voice of Russia in its final days on the air, please consider submitting and sharing your recordings on the Shortwave Radio Audio Archive. Please contact me if you have any questions. This entry was posted in Broadcasters, International Broadcasting, News, Shortwave Radio and tagged Voice of Russia, Voice of Russia Cuts, Voice of Russia Ends Shortwave, Voice of Russia Leaves Shortwave, Voice of Russia Shortwave, VOR on March 20, 2014 by Thomas. “Here is the reason why VOA needs to keep broadcasting on shortwave. Russia (or China or Angola or Zimbabwe or Iraq or Afghanistan or Syria) can easily block Internet access — to include, and particularly from, VOA. While shortwave can be jammed it takes a little more effort (and a considerable amount of budget to pay the electric bill for the high-powered jamming signals). Unlike AM and FM radio transmission, shortwave transmitters can be located continents away from the strife for protection of the transmission infrastructure. This entry was posted in Broadcasters, International Broadcasting, News, Shortwave Radio and tagged BBC, Broadcasting Board of Governors, Press Freedom, Russia, Ukraine, VOR, Why Shortwave Radio on March 5, 2014 by Thomas.